In the early 1970s, Church Educational System and BYU instructor Larry Flake produced Mighty Men of Zion, a lengthy tome containing short 1 to 3 page biographies of LDS general authorities up to the publication date. It was reissued in 2001 as Prophets & Apostles of the Last Dispensation. In the early 1980s, the semi-anti-Mormon press Signature Books published A Book of Mormons, a title containing many short biographies of various “Mormon” connected persons, sometimes having little to do with the LDS Church or having been opposed to it. Some two years ago (in 2015), Cedar Fort published Jerry Houck’s (another CES man) Witnesses of Christ: Prophets and Apostles of Our Dispensation, a volume containing biographical summaries of the first 82 apostles to be ordained, beginning with Joseph Smith. These 3-4 page entries seek to summarize life history but also include inspirational or exceptional stories from those lives. This is the most recent such treatment I am aware of seeking to delve into apostolic life history and inspirational experiences. In 1980, a book compiled by Stephen Stokes and Joseph Muren called Testimony appeared, published by Bookcraft. This fine work collected various quotations from modern general authorities to explain and expound on the facets of a latter-day saint testimony; meaning the sure knowledge that God lives and Jesus is His resurrected son. The subject matter is much broader than that of the testimony of a special witness, and generally applies to all latter-day saints seeking to know spiritual realities. In addition to the above mentioned works, a number of biographies have been published about apostles, or special witnesses of Jesus, that usually contain reference to their calls to the apostleship and their testimonies. This brings me to the present announcement. This coming September is the anticipated release date for my next book (published by Cedar Fort): I Know He Lives: How 13 Special Witnesses came to know Jesus Christ. This 300 page work contains some elements of many of the above mentioned works, including some biographical scaffolding and stories of inspiration and trial and tribulation, but after that the resemblances diminish. I would suppose that Bryant Hinckley’s book might be thought the closest to mine of any of them, but as fine a volume as it is/was, it did not concentrate on the gaining and bearing of the special witness of the apostles in the way my book does. I Know He lives will contain an Introduction followed by part 1 containing 3 introductory chapters. 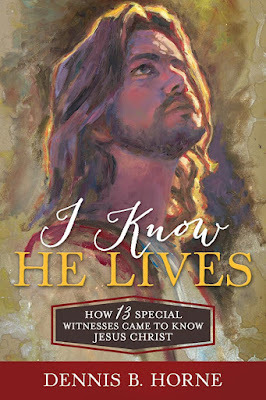 The remaining space (part 2) then reviews how these 13 specially selected apostles came to know, and I mean know, Jesus the Christ as He lives today—resurrected, glorified, and exalted. The chapters (in manuscript form) are from 8 to 18 pages long. They do touch on life history, but then concentrate on the hardships and disciplined spiritual preparation each man received, and especially how they came to know Jesus personally. As we have seen, there has never been another book quite like it. Culled from a vast body of LDS literature are these humbly but forcefully expressed testimonies of Jesus as declared by 13 modern apostles. Each of them is now deceased, and a few of them are mostly forgotten by the collective church today, but most of them are still well-known to the older generation, and all of them served as powerful special witnesses of Jesus Christ. Great contribution! Excited for your book to come out, Dennis.